Preheat oven to 450°. Line a rimmed baking sheet with parchment paper. In a large bowl, stir together sugar and lemon zest. Scrape seeds from vanilla bean and add with bean pod to sugar mixture, stirring to combine. Add berries; toss gently to coat. Spread evenly on baking sheet. Roast until berries have released some of their juice and are starting to soften, 8 to 10 minutes; be careful not to scorch. Transfer berries to a bowl to cool slightly, about 5 minutes. Discard vanilla pod. 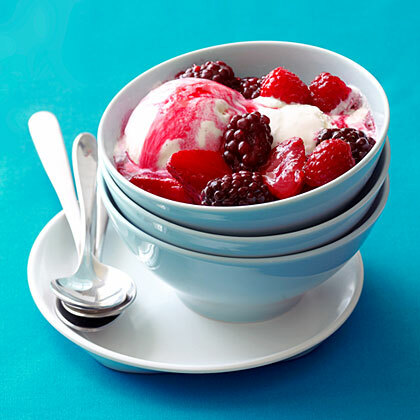 Scoop ice cream into serving bowls and top with berries.